Joe Satriani is the world’s most commercially successful solo guitar performer, with six gold and platinum discs to his credit (including one more gold award for the debut album by his band Chickenfoot), and sales in excess of 10 million copies. His last studio album, Shockwave Supernova, was hailed as yet another creative breakthrough – this for a guitarist who has routinely topped guitar magazine polls since the release of his first full-length album, Not Of This Earth, in 1986. His 16th studio album, What Happens Next, will be released on January 12th with a full U.S. tour slated to begin the week of release. Since September 18, 1970 (the day his idol Jimi Hendrix passed away), Satriani has dedicated himself to the artistry of instrument. While still a teenager in his hometown of Westbury, New York, he taught guitar to another budding six-string hopeful, Steve Vai. A few years later, Satriani moved to San Francisco and played guitar in a popular new wave band, The Squares, and briefly joined The Greg Kihn Band before the release of Not Of This Earth. Satriani’s reputation was already growing in guitar circles – along with Vai, some of his other students were Metallica’s Kirk Hammett and Testament’s Alex Skolnick – but in 1987, he broke through to the masses with his second studio full-length, Surfing With The Alien, a massive seller (it hit No. 29 on the Billboard 200) that included the radio hits “Satch Boogie” and the title track. The success of that album caught the attention of Mick Jagger, who asked Satriani to be his lead guitarist on his first-ever solo tour, in 1988. As a live performer, Satriani has toured the world with each new release (his last concert tour for 2013’s Unstoppable Momentum saw the guitarist touch down in 32 countries). In 1993, he joined Deep Purple as a temporary replacement for Ritchie Blackmore during a Japanese tour. In 1996, Satriani founded the multi-guitarist traveling experience called G3, which has seen him share stages with Vai, Eric Johnson, Yngwie Malmsteen, Robert Fripp, among others. And starting in 2009, Satriani traversed the globe again as a member of Chickenfoot. The all-star band (which also includes singer Sammy Hagar, former Van Halen bassist Michael Anthony and Red Hot Chili Peppers drummer Chad Smith) has issued two albums, their debut and 2011’s follow-up, Chickenfoot III. Satriani’s solo discography includes a host of classics, including 1989’s Flying In A Blue Dream, The Extremist from 1992, Is There Love In Space? (2004) and 2010’s Black Swans And Wormhole Wizards. His 15 Grammy nominations have been for songs such as “Always With Me, Always With You,” “The Crush Of Love,” and “Summer Song,” as well as full albums like Surfing With The Alien, The Extremist and Super Colossal. Satriani has appeared in motion pictures such as Christopher Guest’s 2006 release, For Your Consideration, and the 2011 Brad Pitt starrer, Moneyball. Through the years, he has designed and endorsed guitars, amplifiers and effects pedals for Ibanez, Marshall and Vox. His JS Series of guitars through Ibanez has been one of the company’s most popular and consistent sellers. Give Your Satch Fan this Sweet Relief! Joe Satriani is back in the game! The legendary guitarist has announced his 16th solo album, What Happens Next, and the 2018 iteration of his G3 Tour featuring Dream Theatre’s John Petrucci and Def Leppard’s Phil Collen. Check out the Guitar World article for the full press release! Another Experience in the books! It was an amazing week at The G4 Experience with Joe Satriani, Tommy Emmanuel, Stu Hamm, and Def Leppard’s Phil Collen! There were instructions, sit-downs and oh so many jams! Check our Joe Satriani’s Official Facebook page for pictures and videos galore! Wishing the happiest of Birthdays to our brother in rock, The Professor, Mr. Joe Satriani! BEST + LIVE is almost here! The new Chickenfoot​ album BEST+LIVE goes on sale this FRIDAY for a killer deal of $9.99! You can pick yours up at your local Best Buy​, or pre-order online! Happiest of birthdays to a legend in the guitar world, our longtime friend, Joe Satriani! And what a way to spend his birthday; playing a show at the Guitare en Scene Festival in St. Julien de Genevois, France with special guest Steve Vai! Joe Satriani’s Surfing to Shockwave Tour entered into Europe yesterday! The European leg of the tour started at the Hellfest Open Air Festival in France and will continue through out the summer to the Nethlerlands, Denmark, Czech, Italy, Spain and more! Check out www.satriani.com/road for more details! Joe Satriani joined up with his old pals Chad Smith, Sammy Hagar, and Michael Anthony for two incredible nights of Chickenfoot in Tahoe on May 7th and 8th. The Foot Soldiers had a blast and so did the band! Photo credit: Jon Luini. Check out who’s on the playbill tonight! 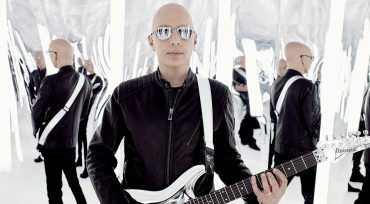 Joe Satriani and the “From Surfing to Shockwave” tour is cruising into Chicago tonight, at the infamous Chicago Theatre! One Week Until We’re Surfing to Shockwave! Exclusive “Surfing to Shockwave” Tour Contest! Joe Satriani is featured on this month’s online magazine Guitar Interactive (UK) cover! Inside is an interview with Joe, as well as his album and tour coverage. AND by signing up for the free site fans can actually view the filmed interview with Joe! Can’t Get Enough of Joe! Wishing the happiest of Birthdays to our long time friend Joe Satriani! Here’s a pic shared on his Facebook page today. Hear it on Yahoo! Music first! On July 24th Joe Satriani’s 15th Solo Album – Shockwave Supernova – which also happens to be Joe’s alter ego, will be released! However, we have a sneak preview of the title track available now on Yahoo! Music! Satch is Shocking France this Fall! Satch is starting off 2015 with studio sessions. That’s right, the rumors are true, Satch will be recording a new album this year and we can”t wait to see what sound he brings to our ears this time! Not sure who had more fun, Joe or the fans, at his birthday gig in Madrid, Spain last night! Photo courtesy of Joe Satriani’s Twitter page – @chickenfootjoe. Check out the Q&A with Joe Satriani live on Rolling Stone’s website. Check out Guitar World online for an exclusivepremiere of Joe’s remix of “Time Machine” — a previously unreleased version from the 1993 album — included in the Box Set coming out in May! It’s the moment Long Islanders have all been waiting for… Satch is coming home! That’s right, Joe Satriani is playing The Space at Westbury – his hometown – on June 7th and tickets go on sale today at noon (EST)!! Ready your dialing or typing digits because these tickets won’t last long! Have we told you about the amazing G4 Experiencein August?! This will be a unique guitar retreat in Cambria, California for guitarists of all ages and levels to learn from, ask questions of, and hang out with Joe Satriani, Paul Gilbert, Andy Timmons and Mike Keneally! Check out www.g4experience.com for more information. Satch’s Unstoppable Momentum 2014 tour is hustling along! We’ve already have multiple shows planned in France and Denmark and are coordinating many more all over Europe. Keep an ear and eye out for more scheduled dates. Satch blew away the Beacon!